Cloud computing presents significant value to organizations. However, the downside is that few organizations wish to trust third-parties with their corporate data. 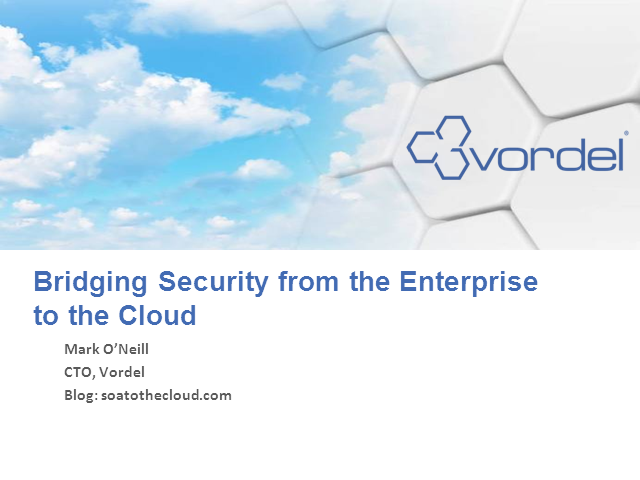 To address this, Vordel enables organizations to safely connect from the Enterprise to Cloud based services without undermining their underlying corporate security policies. With Vordel, organizations can enforce security and privacy policies on their Cloud usage, monitor service quality, and control cloud service usage. This is especially important since Cloud services are paid for. Using core Enterprise Security Infrastructure Vordel simplifies the task of securing application integrations from the Enterprise to the Cloud. Whether it is single sign-on to Cloud services, federated identity with partners, or to reinforce RESTful API security, Vordel connects applications safely across multiple domains. Don’t rely on Cloud service providers’ security and operational integrity, and the often questionable SAS 70 certification. Use Vordel to maintain security and control in your hands. Bio: Mark is responsible for overseeing Vordel's technical development roadmap. He is a contributing member of the Cloud Security Alliance, and has a degree in Mathematics and Psychology, and graduate qualifications in neural network programming from Oxford University. Mark is the author of Web Services Security, published by McGraw-Hill.